Has your dog just been diagnosed with diabetes? Take a deep breath. Diabetes in dogs is almost always manageable and, with good care and monitoring, your diabetic dog can live a normal, healthy lifespan. 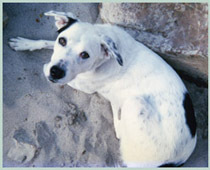 This site was inspired by our dog Chris, who was diagnosed with diabetes in September 2003. Chris never did anything by "the book" so he was one of the challenging cases. But through home testing his blood sugar and learning as much as we could about how insulin and food interact, we found a system that worked for him. Interested in how Chris traveled 2,400 miles round trip while blind and diabetic? Look here. Chris passed way in August 2008 at 14, an advanced age for a dog his size and especially for a dog with a severe prediabetes heart condition and eventually cancer. Diabetes never held Chris back and did not shorten his lifespan. It truly was the least of his problems. It can take a few months to get to "cruise control" so don't worry if your dog isn't instantly regulated. At the same time, good regulation is invaluable to your dog's health and well-being so it's worth pursuing. The main adjustment you will need to make is to get into a routine of feeding your dog at the same time very day, usually two meals and insulin injections a day 12 hours apart. Every dog is different. The trick is to find out what works best for your dog. You and your vet can vary the kind of insulin, diet, and timing of meals and injections to find the right combination. And remember, diabetes is something people manage every day for themselves. It's actually easier with a dog in that you have a lot of control over what they eat! So managing your dog's diabetes does not have to be a mystery. You can learn to manage your dog's treatment and monitoring. 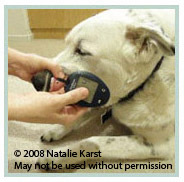 Handheld meters like the OneTouch Ultra and AlphaTrak allow you to test your dog's blood sugar at home. To see how to collect the tiny sample of blood needed to do this testing, please see our page of video and picture tutorials: www.k9diabetes.com/bgtestvideos.html. Many of these videos are posted at our YouTube Channel. With insulin injections (of NPH, Vetsulin, Levemir), you are replacing a very sensitive body system that adjusts the amount of insulin available moment by moment with an artificial system that provides a few injections of insulin a day and meals that deliver sugar into the bloodstream as they are digested. So insulin and food are an issue of balance. Kind of like a race... a relay race really, because there is constant processing of the food and the insulin throughout the period of time between meals and injections. The finish line is the bloodstream. Click here to learn more about getting the best regulation of your dog's blood sugar through attention to food and insulin. Copyright 2008–2017. All rights reserved. Photographs may not be used without permission. For more information, contact K9diabetes.